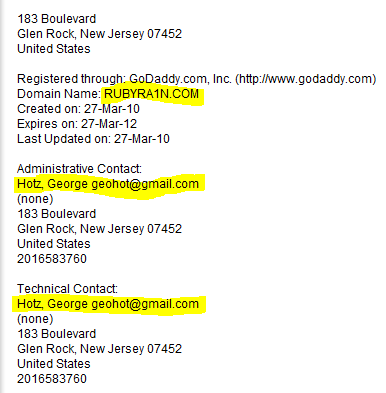 Rubyra1n : GeoHot Jailbreak for iOS 4.2.1? All information is the same as limera1n domain, making it appear legitimate. Anyway this is only the registration of a domain, does not necessarily mean that GeoHot will release a new jailbreak, and information have to be true … anyone can register a domain using that data, so we will leave that for now as a rumor, we’ll see if indeed it becomes a new Jailbreak (iOS perhaps 4.2) or if it is someone wanting to make noise … it is even possible that it is registered GeoHot but do not ever use that name. In the absence of one or two weeks to go iOS 4.2 (some rumors pointing to Sunday but we can not confirm with any source), it is most likely still be a while until the iPhone Dev Team and Chronic Dev Team and as GeoHot and company find that the exploits that are saved are still there, that the new baseband also has vulnerabilities that allow release, etc. The record was made quite some time (in March this year) but nobody seems to have talked about him all this time. Quickoffice Connect for iPhone is FREE Now. Download Today! The great Mobile Star Award! winner Office suit Quickoffice Connect for iPhone By Quickoffice, Inc. is FREE for a limited time only. Download Today! Try out and experience our award-winning Quickoffice Connect™ Mobile Suite with full editing of Microsoft Word documents and Excel spreadsheets. You may upgrade within the application to save any edits. Quickoffice Connect™ service allow users to easily access, view and share files from multiple cloud storage services, including MobileMe, Dropbox, Google Docs, and Box.net. From a single, convenient application, you can access content from anywhere, manage content on-device, transfer files via WiFi, and share files via email or your cloud service provider. With Quickoffice Connect, you’ll have easy access to your content across multiple devices, from office workstations and home computers to laptops, iPhones or the iPod touch. Our intuitive interface is so easy to use, you can access remote content from anywhere and share files via email or save them to your remote cloud storage accounts. • Access iPhone email attachments from any email service – no need to have MS Exchange. Quickoffice Connect will list any file type without restriction. • Separate charges may apply from Service Providers for file storage and related services. • Does not support iWork ’09. • Password protection of the entire application keeps your content safe. • Secure personal data – your remote service provider credentials and information are NEVER transmitted outside of your mobile cloud service account. Visit Quickoffice.com/Connect for full technical details. We’ve seen several offerings for Mac-based AirPrint support for non-AirPrint blessed printers, but now it’s time for iOS Windows users to get in on the wireless printing action. AirPrint activator is a simple one-click solution, which installs a small AirPrint.exe utility enabling iOS 4.2.1 to print to any shared printer connected to your Windows PC. The free program supports both 32bit and 64bit systems, and all you have to do is make sure AirPrint.exe can get through your firewall, as long as you trust it of course. or download and get your Windows-based AirPrint.